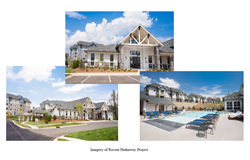 PointOne Holdings in partnership with Hathaway Development started construction on a new luxury Class-A apartment community development in the high-growth Raleigh-Durham suburb of Holly Springs, North Carolina. Named the Exchange at Holly Springs, the Project will be a 316-unit Class “A” luxury garden-style apartment community featuring a mix of three and four-story apartments buildings and carriage buildings which will include units with garages and direct access to the street. The gated community will include elevators in its four-story buildings, a spacious resident clubroom and business center, state-of-the-art fitness center, resort-style pool with outdoor grilling areas, a dog park and spa, detached garages, package concierge service, and bike storage. The units will all feature high-end finishes such as, granite counter tops, designer cabinetry, and hardwood style flooring. Located in the Wake-South/Southwest submarket, the Exchange at Holly Springs will enjoy excellent visibility along the burgeoning Highway 55 corridor as well as excellent walkability to outstanding retail and top-rated schools. In addition, Holly Springs is now served by the recently completed I-540 Triangle Expressway, a major connector providing direct and rapid access into the Raleigh-Durham Research Triangle. The Project’s location in Holly Springs is just 25 miles from downtown Raleigh, Raleigh-Durham International Airport and The Research Triangle Park.